Yes, I received a copy of this book for free. Yes, I left it in NYC and then purchased the audiobook and listened to it. Once. But I never wrote anything about it. I never followed Pam Slim‘s rules, I never bothered to make a plan and I didn’t think to take responsibility for my own business ventures. This isn’t a book you read once and forget, it’s a book to write notes in. Part reference guide and part inspirational, Escape From Cubicle Nation is more about starting your new career than ending your old one. If you want to be a freelancer, read this book. If you want to be an entrepreneur, read this book. If you’re unhappy where you are and think you have a set of skills that are worth something, read this book. But don’t read it if you just hate your job and life in general. Find help for that first, then read this book. The lessons are wasted if you don’t. , for helping me and people like me realize it’s not enough to not like what you’re doing and it’s not enough to want something else, you have to PREPARE for success. 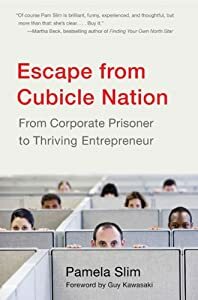 Escape from Cubicle Nation is on my “to read” list. I’m looking forward to it.